Carex stricta perennial, mounded, forming large, often raised, clumps, usually in groups, colonial from rhizomes, stems 40 cm to 1.4 m long, lax, longer than leaves, angles rough; lowest leaves bladeless, becoming fibrous in age, ligule pointed, much longer than wide. 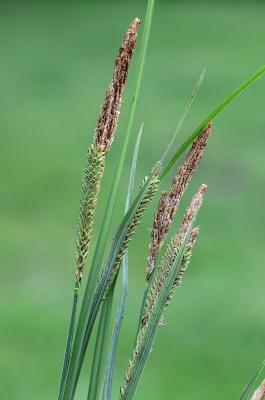 Leaves with blade 0.3-0.6 cm wide, “w” shaped in cross section, thin, drooping, dark green; flowering stems with sheathless, leaf-like bracts, the lowest more or less as long as the inflorescence. 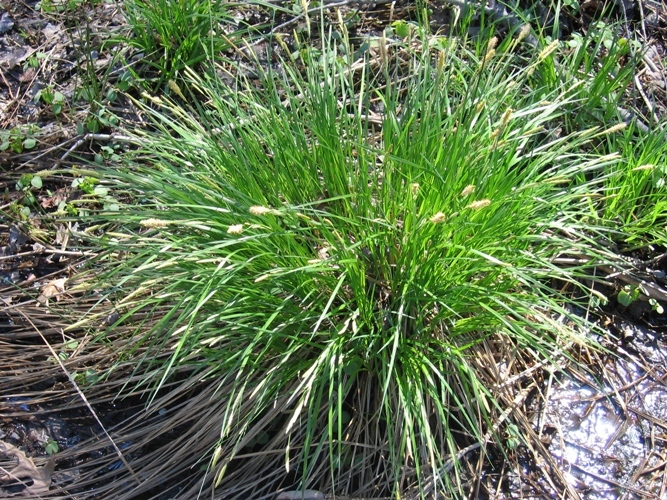 Carex stricta inflorescence. © DCR-DNH, Gary P. Fleming. (c) Virginia Botanical Associates.Blacksburg.vaplantatlas.org (Accessed 5/2013). Flowers: male flowers often at top of spike, inconspicuous, scales reddish-brown with a pale midrib, perigynia flattened, egg-shaped, 0.2-0.3 cm long, tapering to a tiny beak; inflorescence of 2-4 linear spikes to 6 cm long, stalkless, close together and often overlapping, erect; blooms and fruits May-June. Habitat: Open, or partly shaded, undisturbed swamp forests, marshes or seasonally flooded areas, soil pH 3.5-7, tolerant of shade, moderately tolerant of anaerobic soil, intolerant of fire, salt, and drought (USDA, NRCS 2010). Notes: Seeds eaten by numerous birds and small mammals, plants eaten by mammals (Martin et al. 1951).